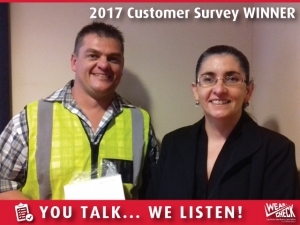 Each year, we conduct a survey in which we ask our customers how we can improve, what works, what doesn’t work and so forth. Your feedback is invaluable to us. This shapes the way forward for us - determining the needs of our customers is critical to the direction our business takes in the future. We have already instituted the suggestions for change and made adjustments to accommodate the constructive criticism. Thank you for your input. As a token of our appreciation for the time taken to provide us with feedback, we award a prize to one lucky customer whose name is randomly drawn from survey respondents. This time round the lucky winner was Willem Britz of Assmang King Mine. Lucky draw winner Willem Britz of Assmang King Mine is presented with his prize, a tablet worth R5 000, by WearCheck technical manager Steven Lumley. A prize is awarded annually to customer survey respondents. Every year, WearCheck Pinetown staff members open up their hearts – and their wallets – to bring some Christmas joy into the lives of the company’s long-term charity partner, the kids at St Vincent's orphanage. 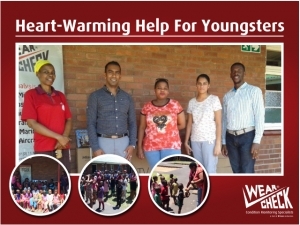 St Vincent’s is based near Mariannhill, Durban, and houses over 100 homeless children. Project co-ordinator Marvin Narainsamy, WearCheck’s foreign operations accountant, decided to do things differently this year. He outlines the plan, ‘’instead of giving the kids the usual gifts which can be short-lived, we decided to give the orphanage a gift that will entertain the children over a longer period of time. ‘We purchased them a 49" LED TV, a DVD player and a range of DVDs that will appeal to all age groups at the orphanage. In addition to this wonderful gift, the WearCheck team also provided the children with a delicious lunch, an ice cream treat and some groceries. The Windaba Expo in Cape Town never goes by without WearCheck being present at this well-attended annual wind technology event. Globally, countries are actively engaging alternative power sources than the traditional oil and coal options in a move to harness abundant natural resources and to be more earth-friendly. 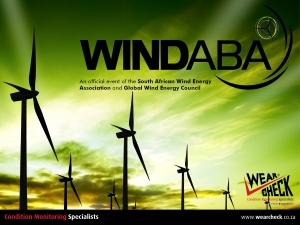 The theme for this year’s Windaba conference was asset management which focused on optimising wind turbine life cycle through the use of remote online monitoring and data analytics. For this year’s event, WearCheck showcased their specialist reliability solutions and newly expanded transformer services divisions with vibration, thermography and transformer oil analysis just been some of the services on offer as part of WearCheck’s condition monitoring portfolio for South Africa’s burgeoning wind industry. Through a good condition monitoring programme, wind turbines are kept operating reliably at their peak output, enabling them to generate an uninterrupted power supply. WearCheck has many valuable assets, but the most valued of all are its members of staff, who dedicate their careers to providing fabulous customer service and world-class laboratory results. One of the factors that helps develop great team work and excellent performance at work is when people know their jobs and the business well, which in turn comes from long-term commitment to the company. 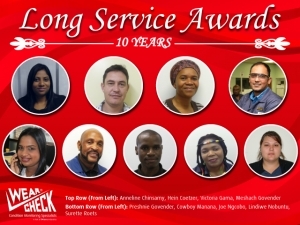 This year, we celebrate these WearCheck workers who have reached the 10 year milestone of being part of the WearCheck family. Well done and thank you for your dedication. 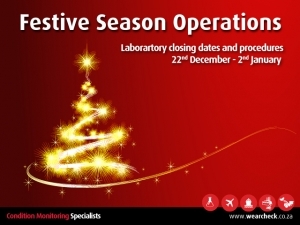 As in years past WearCheck is committed to providing service and support during the traditional close down period at the end of the year. 23rd December - Open , 25th December - Closed, 26th December – Closed, 27th December - Open, 28th December - Open, 29th December - Open, 30th December - Open, 1st January - Closed, 2nd January - Open. Our driver will continue to do deliveries and collections where applicable. Customer support and a sales representative will be available. Any samples collected or delivered to this office will be sent to Pinetown for analysis. The fuel and transformer analysis laboratories (JHB, Durban and Cape Town) will be available for emergency samples only. This laboratory will be closed, however there will be customer support available and any samples delivered before 12:00 will be sent to Pinetown for analysis. All other offices will be closed, therefore should you require any assistance please contact customer support at our Durban and or Johannesburg offices. Samples can be sent to Pinetown via the usual Post Office Speed Services or via your own courier. We would like to thank you for your support during the course of the year and wish you all the very best during the Festive Season. An inferior base oil cannot be converted into a premium product simply by the inclusion of an additive. Using a poor-quality oil on a continuing basis and attempting to overcome its poor lubricating qualities with some special additive is illogical. 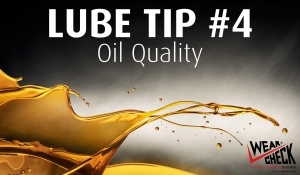 It is better to determine the manufacturer's recommendation as to the minimum API service rating required and then regularly use a blended lubricant of a higher service classification than originally recommended, if an improvement in lubrication is the objective. From "The Practical Handbook of Machinery Lubrication"